On a night out when we’d all had a few too many glasses of champagne, my best friend Charlotte decided that for her 40th birthday we’d all go to the Maldives. What a great idea I thought! A week together on a beautiful island in the middle of the Indian Ocean sounded like a blast. 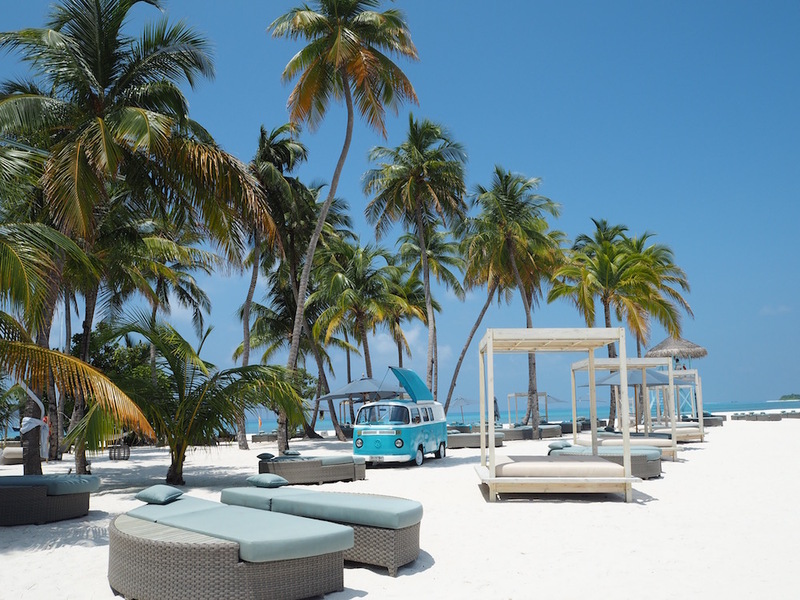 What started as a drunken idea quickly became a reality when a few months later Charlotte found this great deal on Luxury Escapes for the island of Finolhu. The Maldives had always been high on my bucket list so I was super excited to finally make it there. 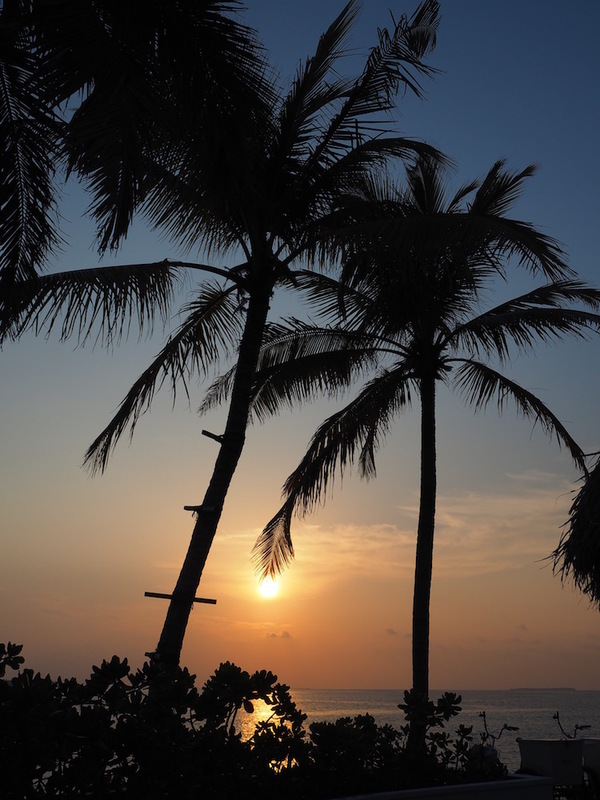 Who wouldn’t be excited to spend a week in paradise? 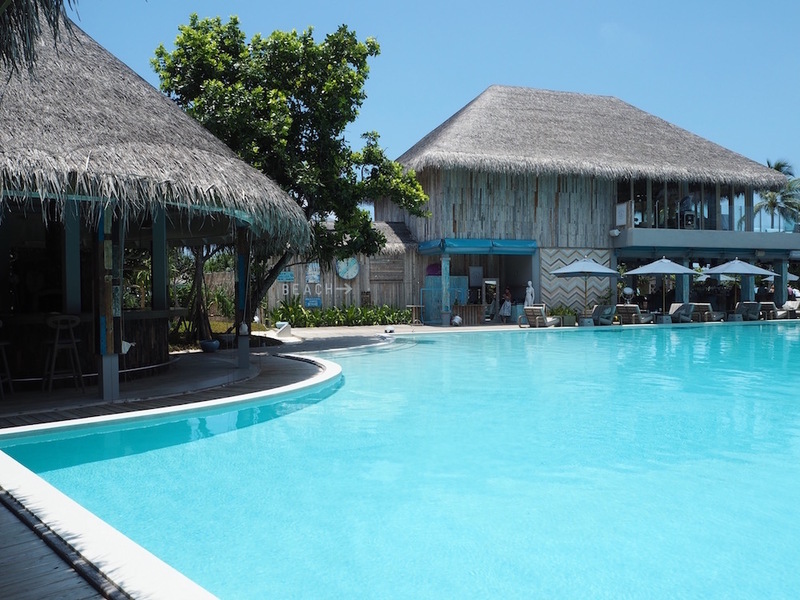 The overwater villas of Finolhu. 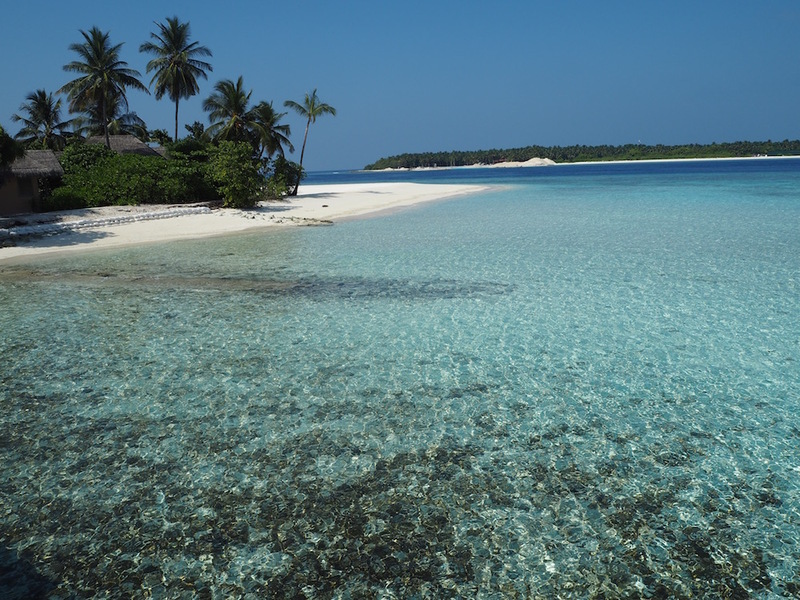 Finolhu is a small island in Baa Atoll, a UNESCO World Biosphere reserve about thirty minutes by seaplane from Male. Arriving at Male airport after a long and tiring flight, we were greeted by a staff member who took care of both our seaplane check-in and the transfer to the seaplane lounge. In the lounge area, we were kindly given fresh juices, coffee and delicious pastries while we waited to board our seaplane. Our holiday couldn’t have started better! 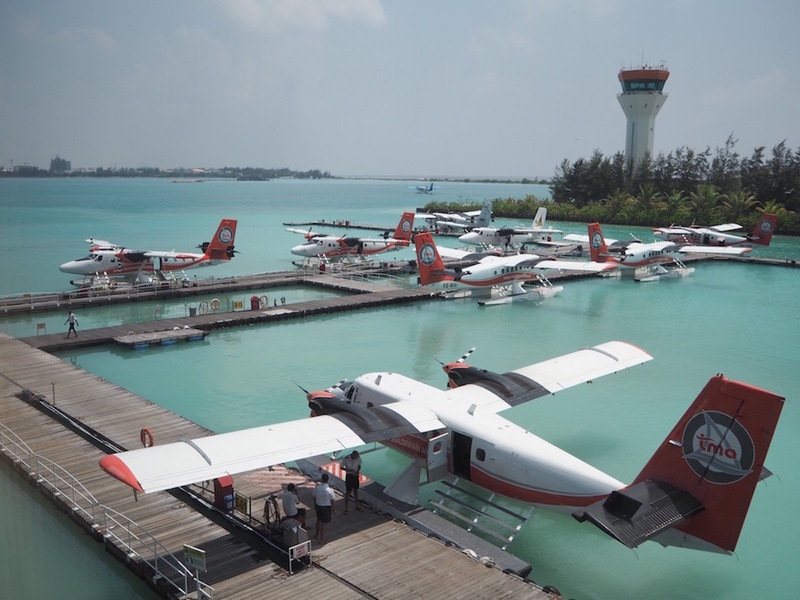 The view from the seaplane lounge in Male airport. So many seaplanes! 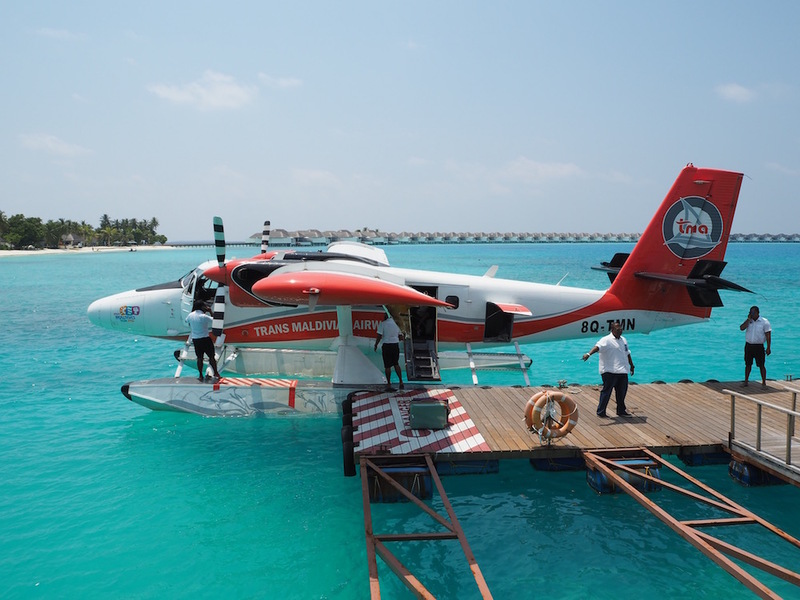 After a little over an hour, we boarded our seaplane and set off for our paradise island. Our flight took us over some of the many islands that make up the Maldives. It was spectacular and we barely noticed the half hour pass by. Coming into land over Finolhu we caught a glimpse of the mile long glistening white sand bar that juts out from one end of the island. It looked amazing! After fifteen hours of travel, we had finally arrived in heaven. The view over the sandbank from the seaplane. 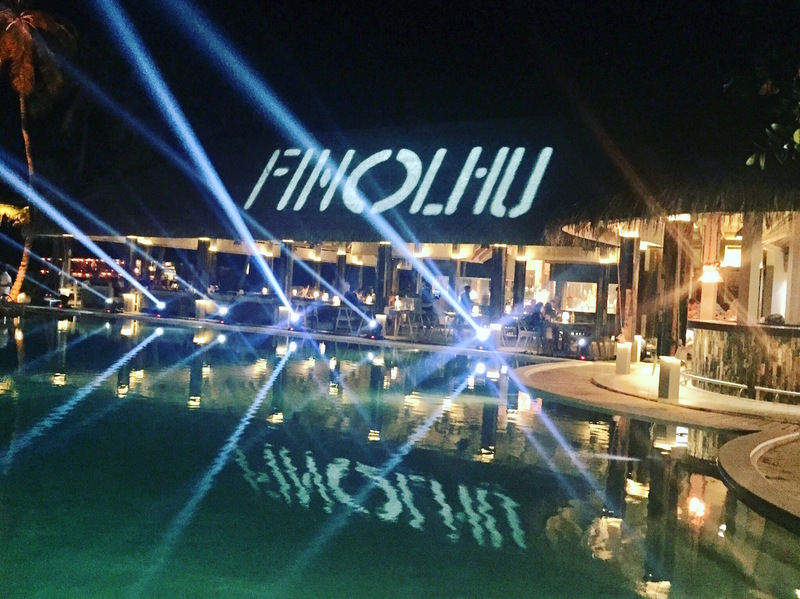 Finolhu opened its doors in June 2016 and is the newest resort in the Maldives, which means everything at Finolhu is brand new, from the villas through to the furniture. Set in a retro glamour style, most of the furniture is pretty quirky which really adds to the charm of the resort. 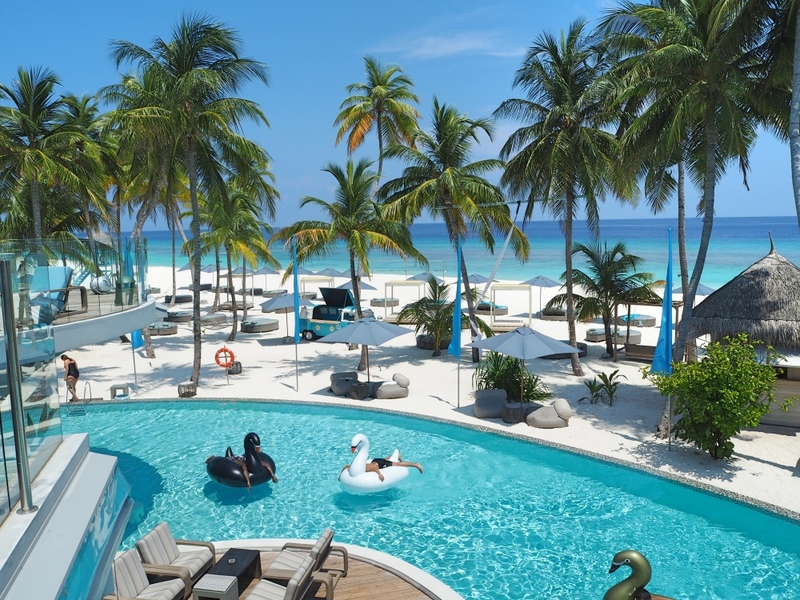 The best part though is the white powdery beaches that surround the resort, the palm trees galore and the dazzling blue sea. I couldn’t believe how lucky we were to be able to spend some time in this beautiful place. 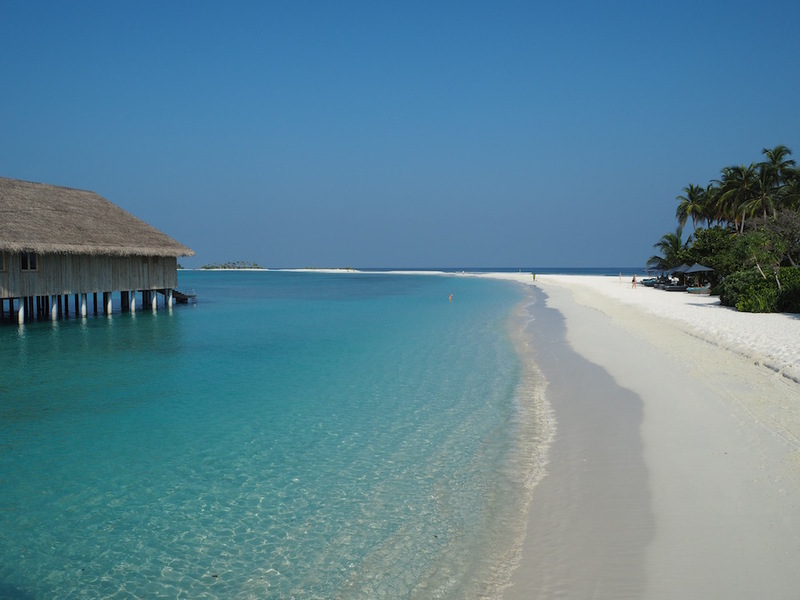 A gorgeous beach awaits us as we arrive in Finolhu. 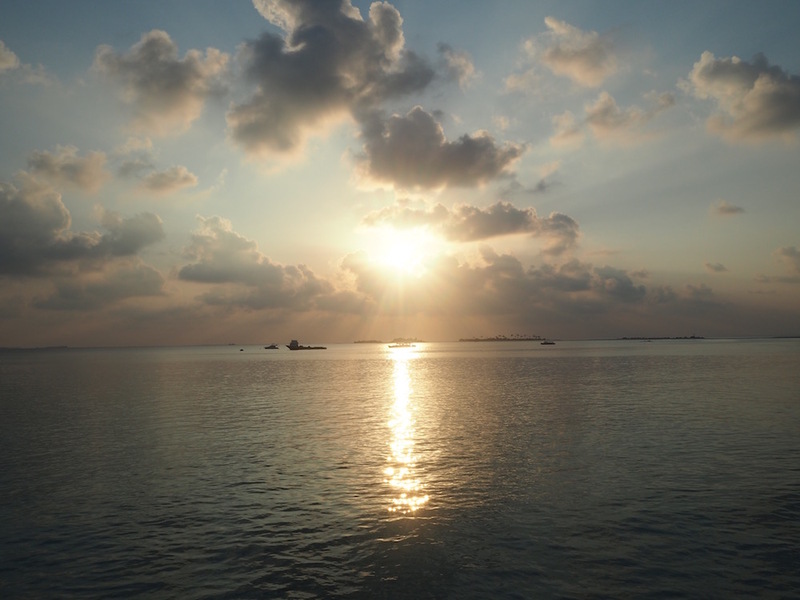 The dazzling water of Finolhu. 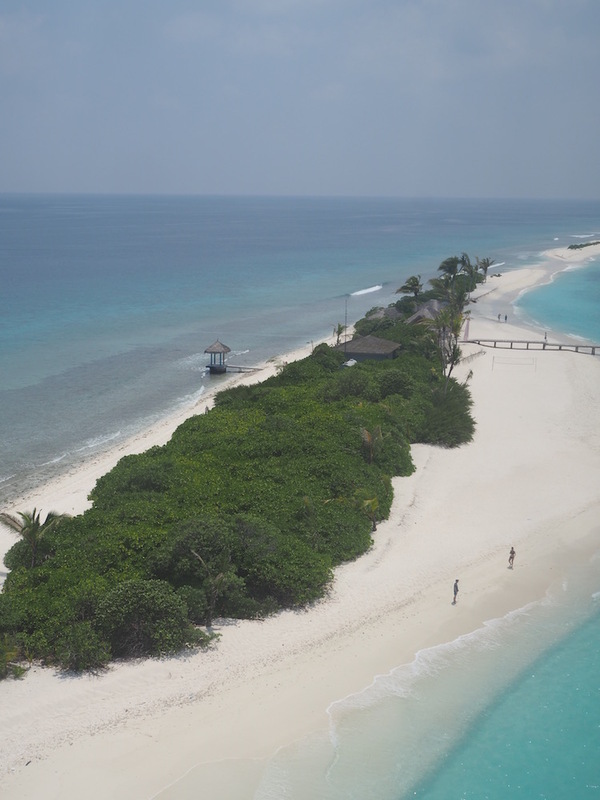 Finolhu has 125 villas, some on the beach and some overwater. 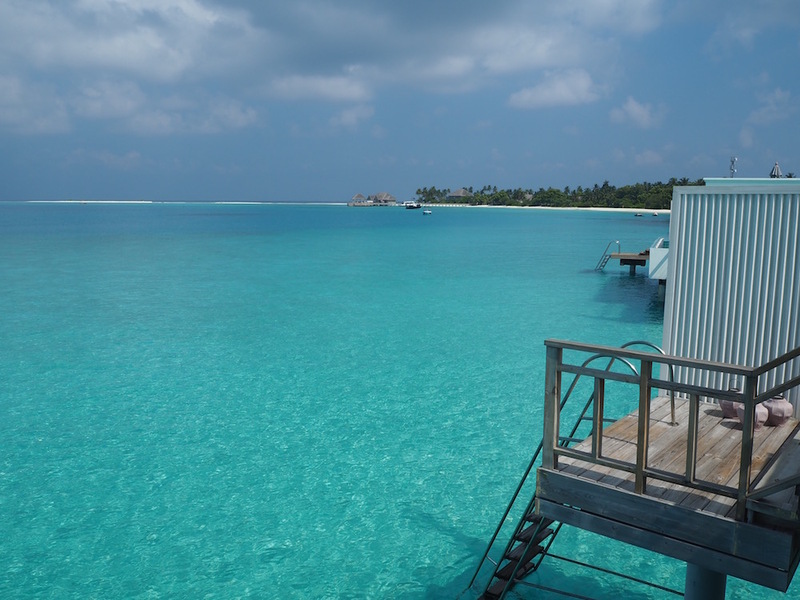 Some even offering their own private plunge pool. But no matter which room you get, you are unlikely to be disappointed because they all looked first class. After checking in and finalising our drinks package (yes we were going to need this!) a member of the staff drove us around the resort in a buggy to show us the restaurants, the gym, the spa and all of the other facilities. We then made our way to the villa which would be our home for the next few days. 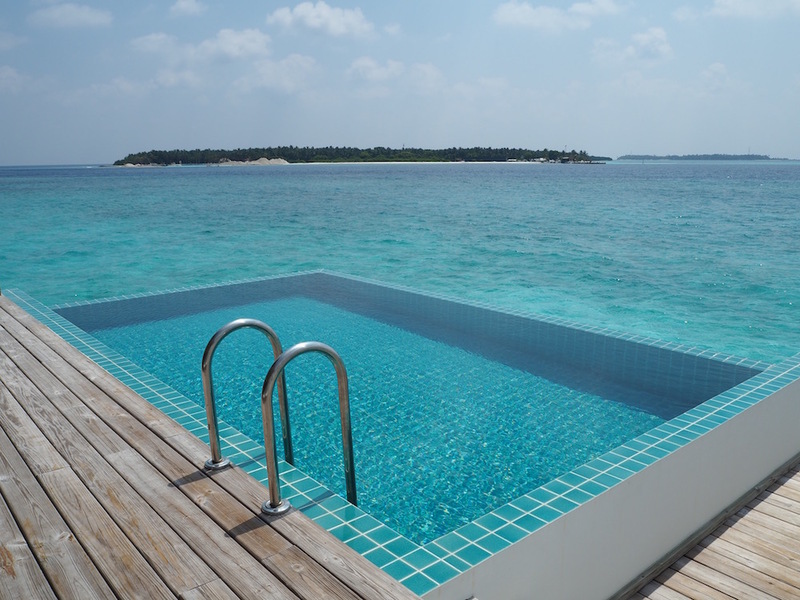 The plunge pool in the overwater villa. Looking across the sand bar from the lifeguard tower. 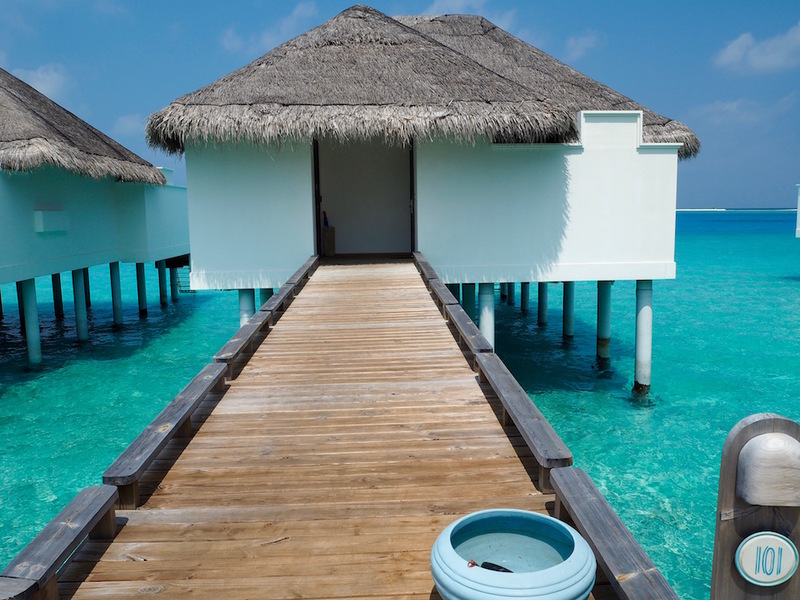 With our Luxury Escapes deal, we were lucky to get an overwater villa. The birthday girl even got one with a private pool! Our room was incredible. It was spacious, clean and very well decorated with luxurious fixtures throughout, and the same retro-chic style as the rest of the resort. 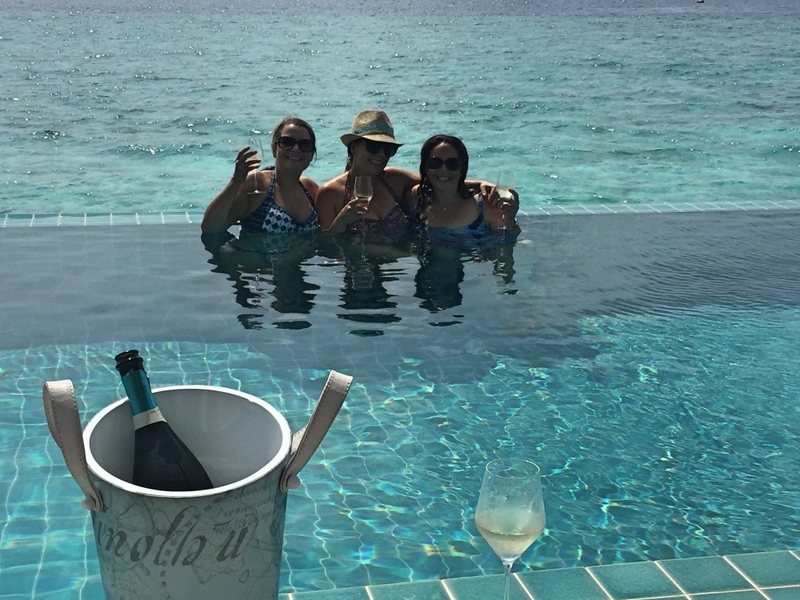 Drinking sparkling wine in Charlotte’s plunge pool! The best part was our deck where we could sit and listen to the sound of the sea while staring out at the stunning ocean views. 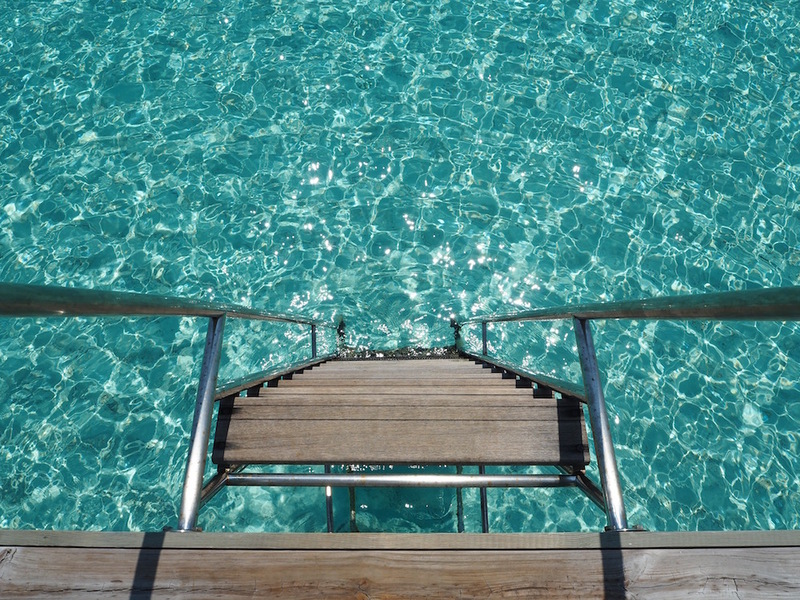 A ladder offered direct access to water (which looked like a giant swimming pool); we could just go and jump right in. Of course, that’s something we did quite a bit, how could we not?! That crystal clear water was just too hard to resist. The deck of our villa complete with funky chairs! So many villas, each with a great view. 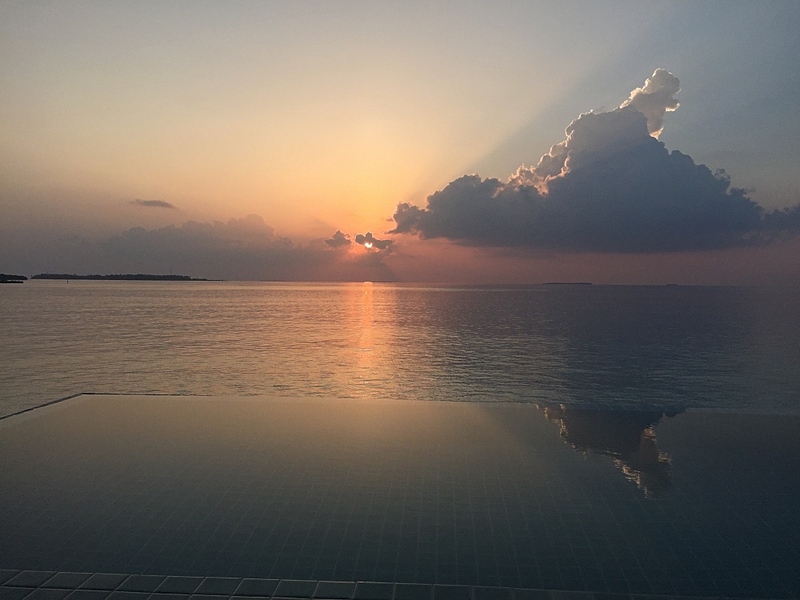 Every morning we would enjoy the sun rising from the privacy of our own deck while Charlotte’s villa had a great sunset view to finish the day. We really had the best of both worlds! Sunset over the plunge pool. 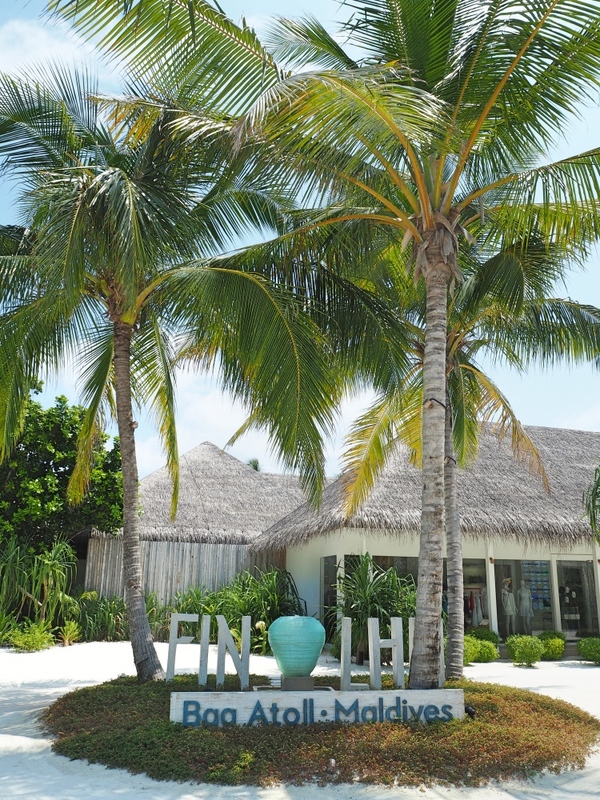 Finolhu has four restaurants and they all offer some amazing food. I don’t remember ever eating as well in any other resort we’ve visited. We started our day with a delicious buffet breakfast at the Baa Baa Beach Club with a huge selection of fresh produce, juices, fruits, themed food and egg stations and the best pastries ever! I am still salivating thinking about that Nutella twist! 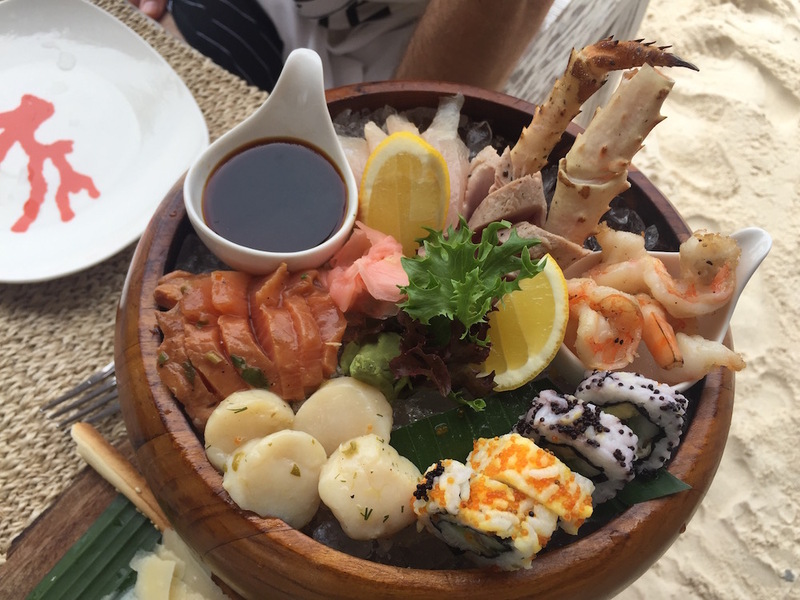 The Baa Baa Beach Club also serves buffet lunch and a buffet dinner with a different theme every night. 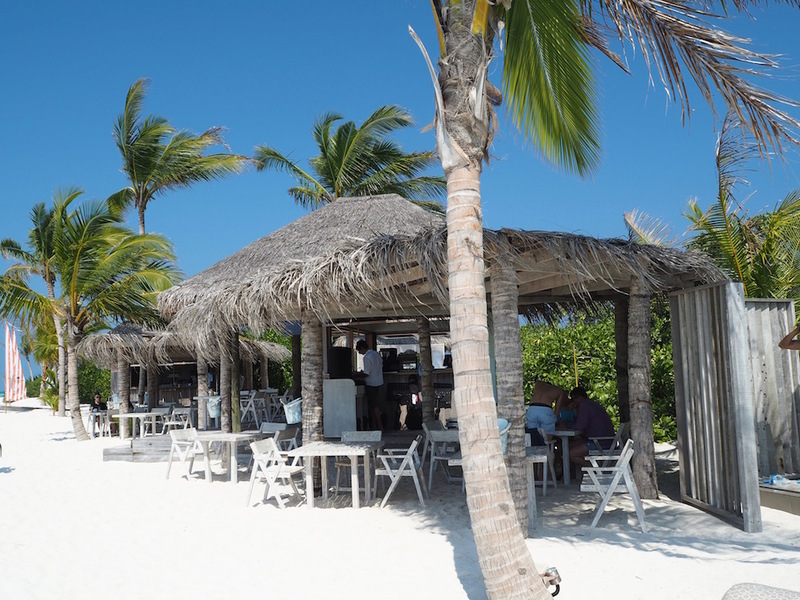 Our favourite lunch spot was at the Fish and Crab Shack which is found half way down the sand bar. Lunch there is a “feet in the sand” affair with buckets of prawns, soft shell crab tacos, fresh seafood, live bands and delicious chilled sparkling rose. I miss this spot every day! Arriving at the Fish and Crab Shack by boat. 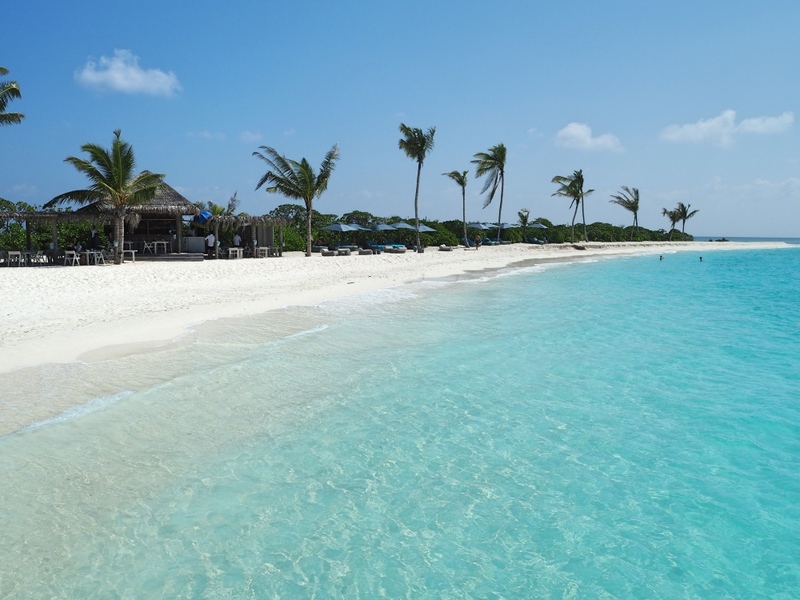 The Fish and Crab Shack is located in the middle of the sandbank. The stunning beach in front of the Crab Shack. A picture with the birthday girl in between courses! The seafood sampler at the Fish and Crab Shack. Delicious! 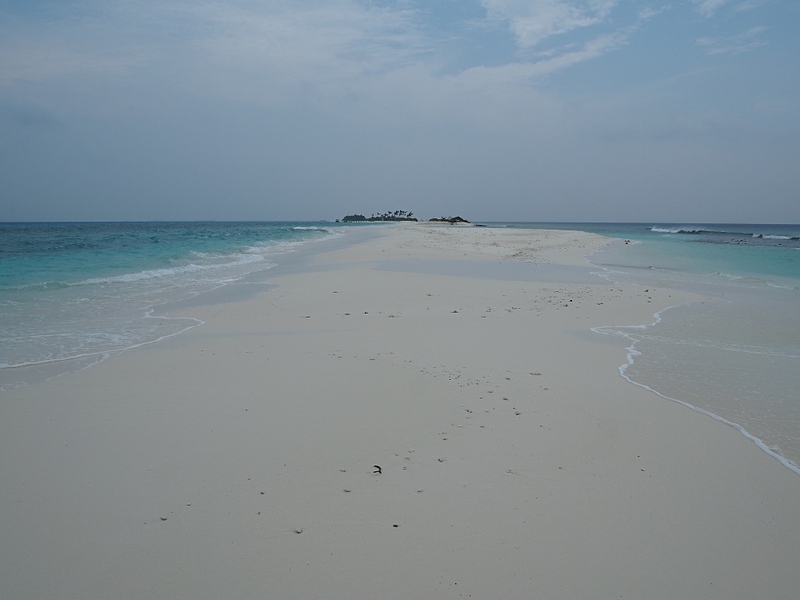 To get to the shack, you either take an easy fifteen-minute stroll down the sandbank or catch the shuttle boat which gets you there much faster. Walking to the Fish and Crab Shack. The other two restaurants are only open for dinner. The Baa Baa Grill offers mouth-watering Northern African inspired food and looks out onto the beach. 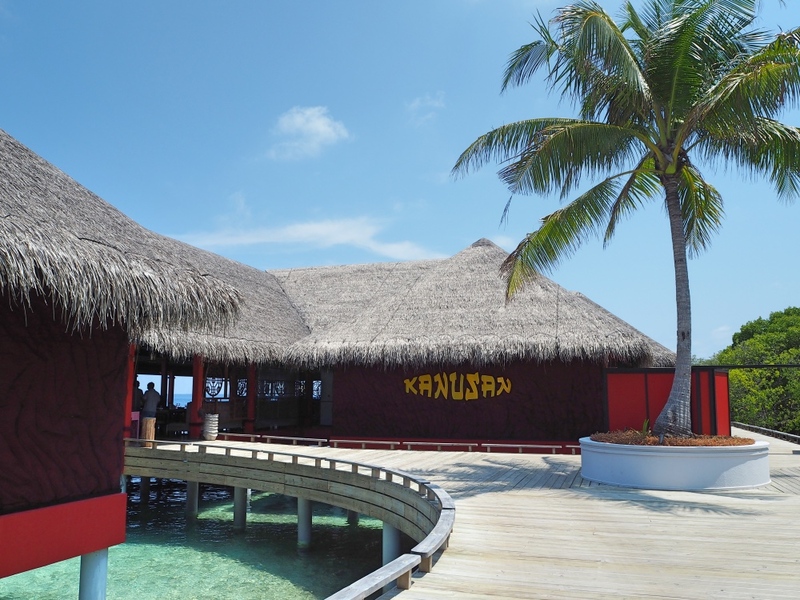 Kanusan is set over the water and serves modern Asian cuisine. Both serve a la carte menus and their food is amazing! From Kanusan we could even see the reef sharks swimming beneath us at low tide. 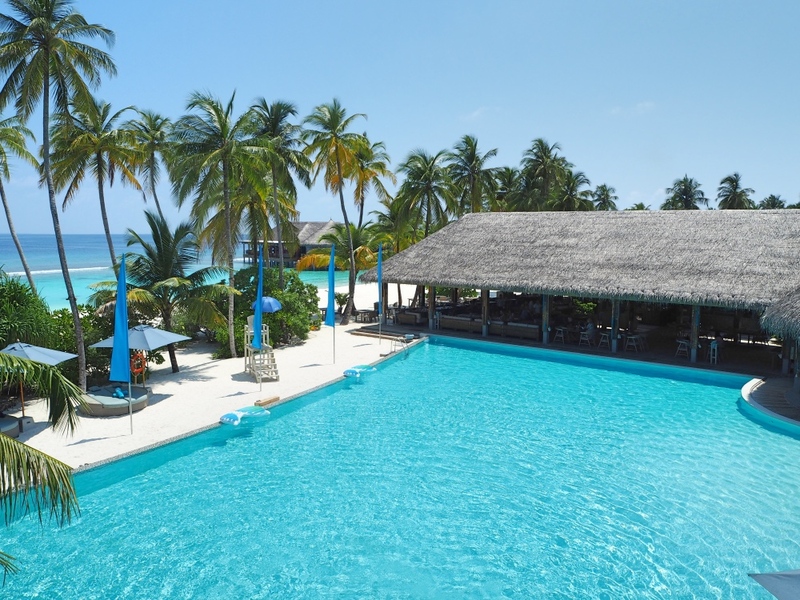 Finolhu’s pool area is decked out with beautiful colours and more of their funky furniture. 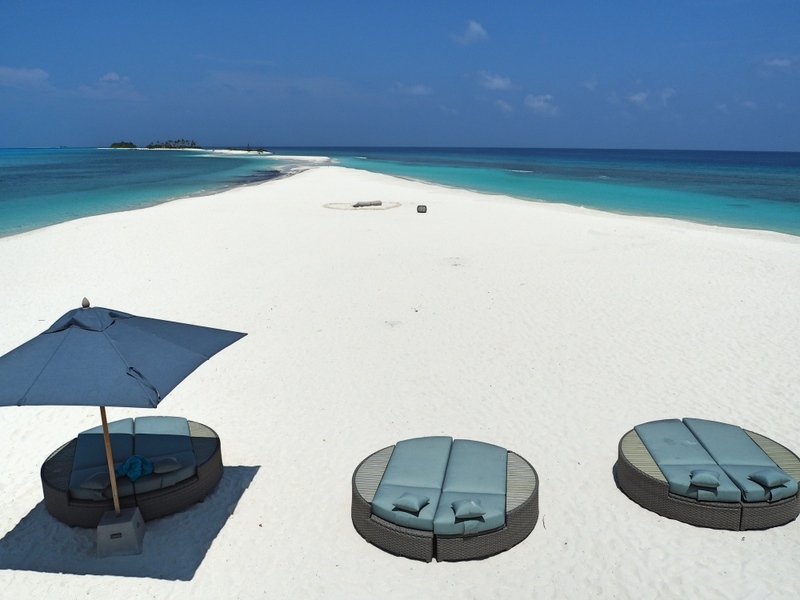 It’s a great place to hang out, to go for a swim, or to simply relax on one of the many day beds, hammocks or lounge chairs with a cocktail in hand! Another cool addition to the pool is the three inflatable swans. I could easily have fallen asleep on one of those! All this was topped off with resident DJ Jaffa’s Baa Baa tunes playing in the background. The view over the pool from the upstairs area of the Baa Baa Beach Club. 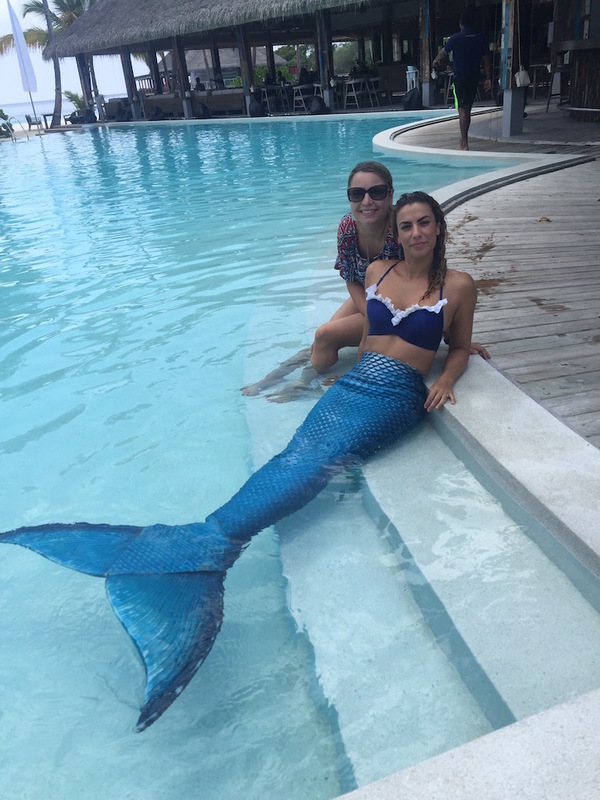 If you hang around by the pool long enough you may even meet the resident mermaid! 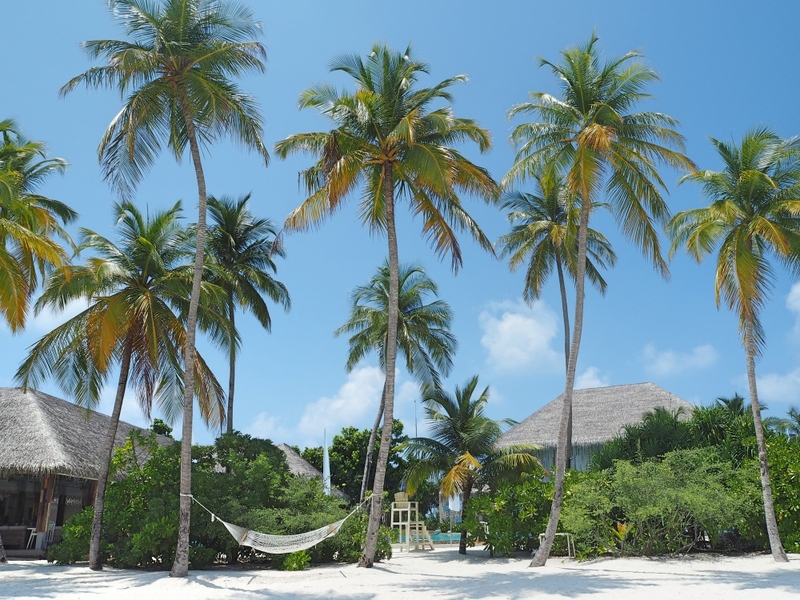 Finolhu is not your usual Maldivian resort island. It’s actually a party island! That’s something we didn’t know when we booked but which actually made our holiday, even more fun, especially since we were celebrating a big birthday. They even change the time zone for the island to make sunrise a couple of hours later to let you sleep in longer! 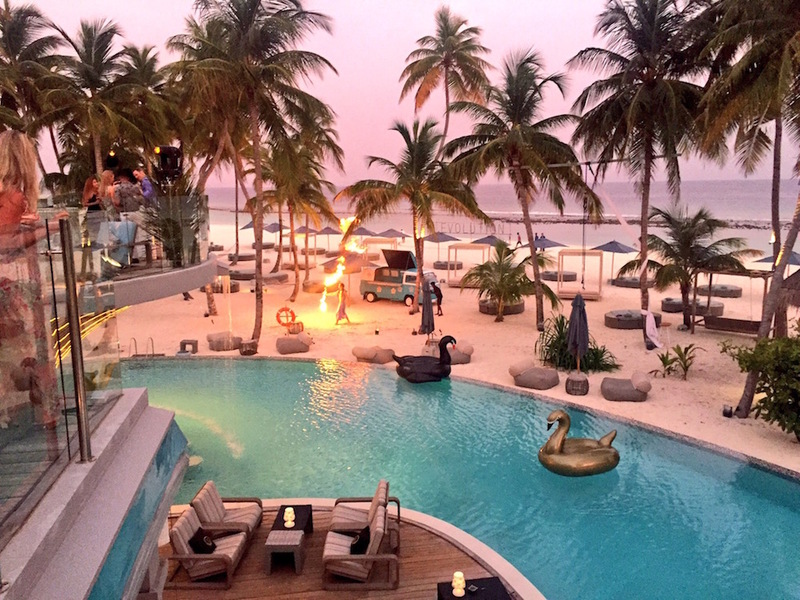 Every evening at the Baa Baa Beach Club began with a live band followed by a DJ, acrobats, a fire show and even a Burlesque show. The “Evolution” party was in full swing during our stay and we had a fantastic time, dancing and even jumping in the pool fully dressed on our last night. Yes, there had been a few cocktails downed prior to this! It was great fun. A night shot of the Baa Baa Beach Club. The staff at Finolhu deserve a special mention as they really contributed to the amazing holiday we had. Everyone was friendly, helpful and always smiling. From the management to the porters, everyone made us feel so welcome. The staff are a true asset to this resort and saying goodbye to some of them was really sad. 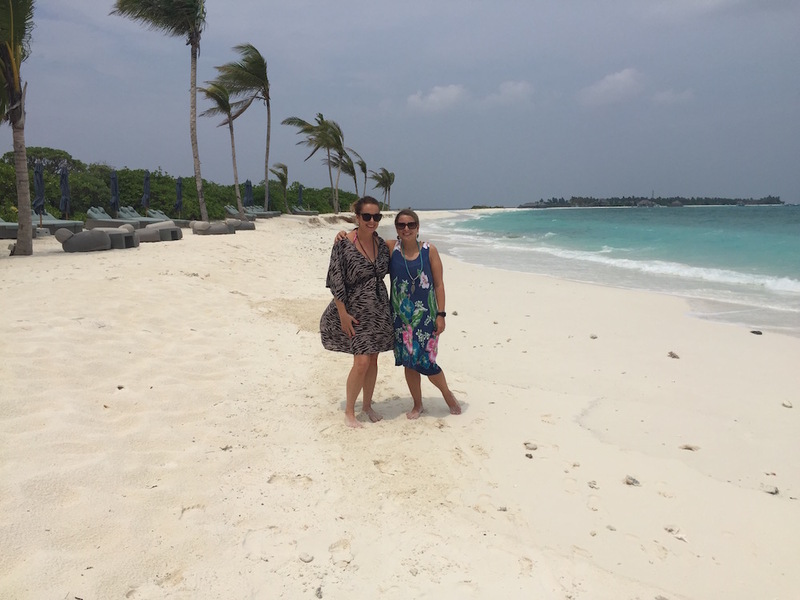 From the moment we landed in Male to the moment we left the resort we were treated to the friendliest service ever. Nothing was ever too much to ask. It’s this kind of service that makes people want to return and Finolhu totally gets this right. The snorkelling at Finolhu was spectacular. We have done a lot of amazing snorkelling in the past but never before have I seen as many colourful fish in one spot. There were thousands of them all next to each other swimming right past you. It was simply incredible. 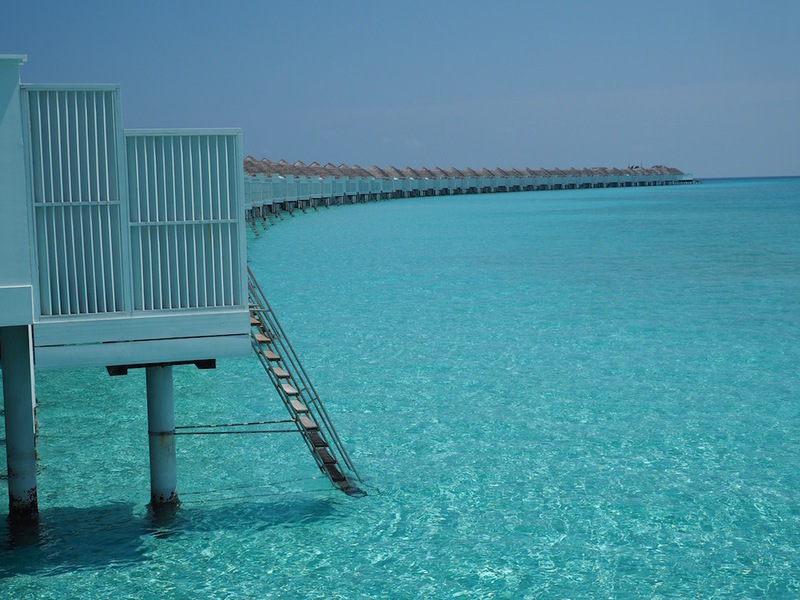 An eagle ray swimming near the water villas. Finolhu organises snorkelling trips to the outer reef where you can see fish, turtles and even Manta Rays if you visit in season (sadly we didn’t). But you really don’t have to go far to see incredible marine life. 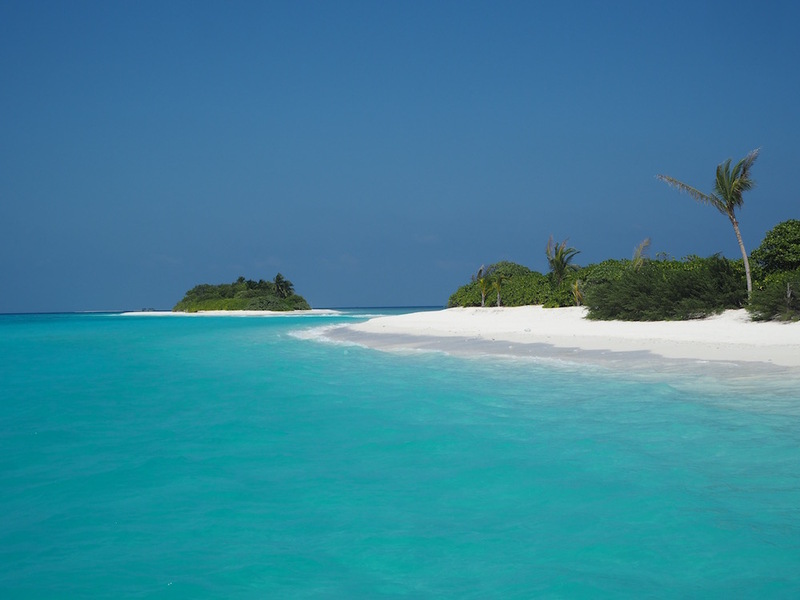 The island offers brilliant snorkelling just a few meters offshore. 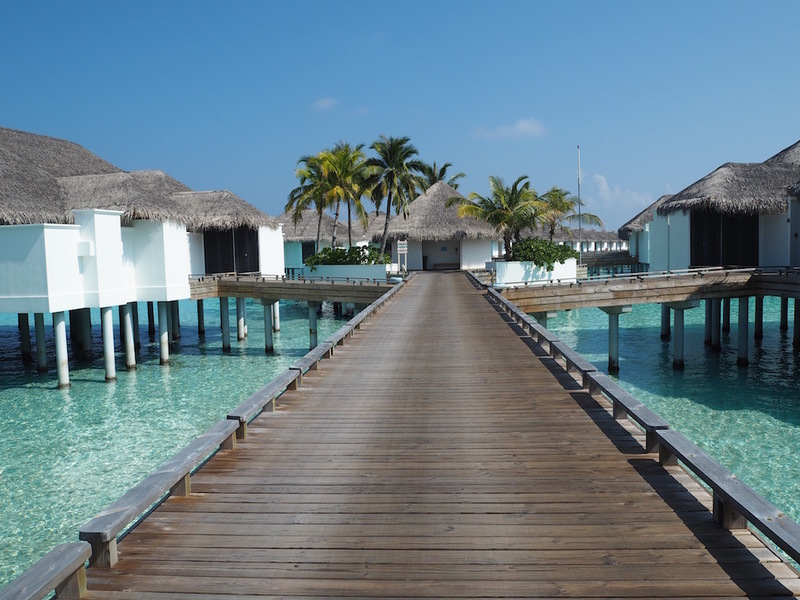 The best place is the huge drop off about a hundred meters out from the water villas (straight across from the Cove Club SPA). Just after sunrise the water there was really calm and clear, and there were so many fish that it felt like we were in an aquarium. 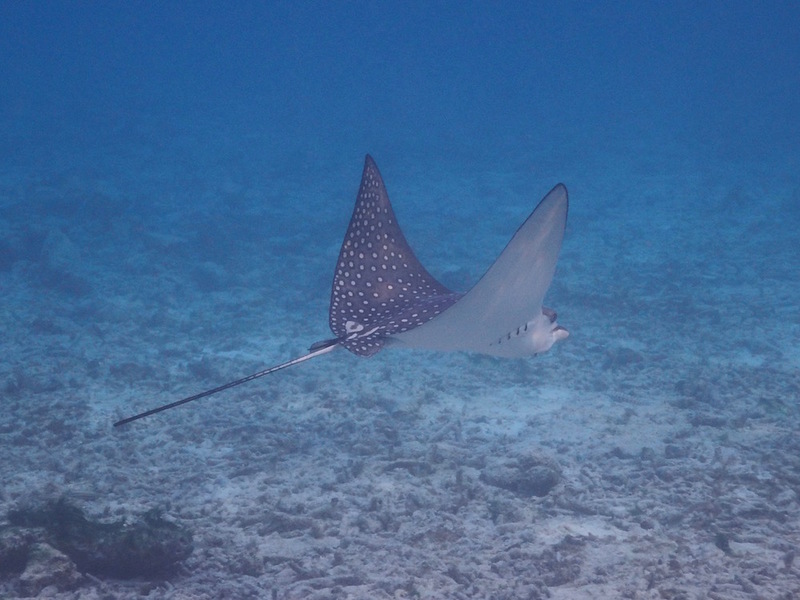 We also saw lots of rays, reef sharks and turtles. 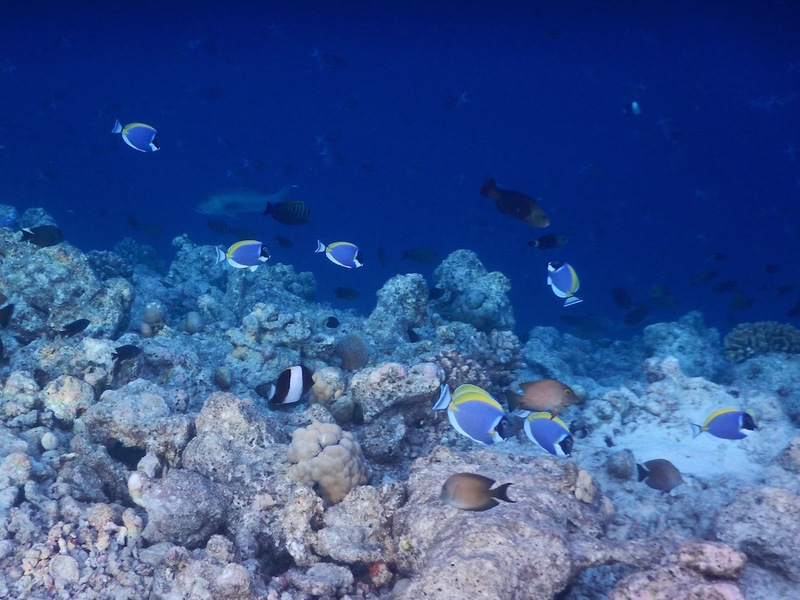 So many Blue Surgeonfish swimming around. 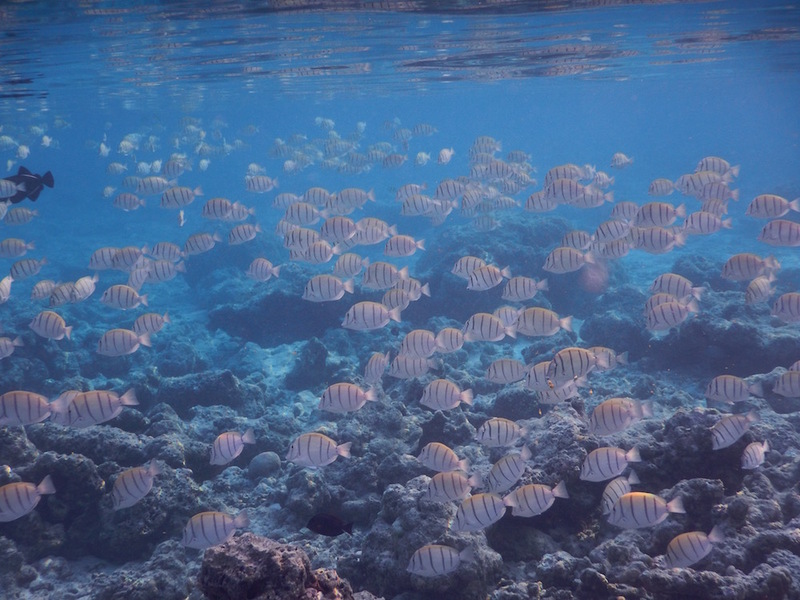 A school of Convict Surgeonfish. Last but not least, the Cove Club SPA was a great place to go and unwind. We had a jet lag massage included in our package and it was heavenly. We also spent quite a lot of time in the steam room, sauna and plunge pool. It is really nice of the resort to allow all guests to use those facilities on a daily basis at no extra charge, unlike many other resorts who will charge you for the privilege. The beautiful view from the Cove Club. 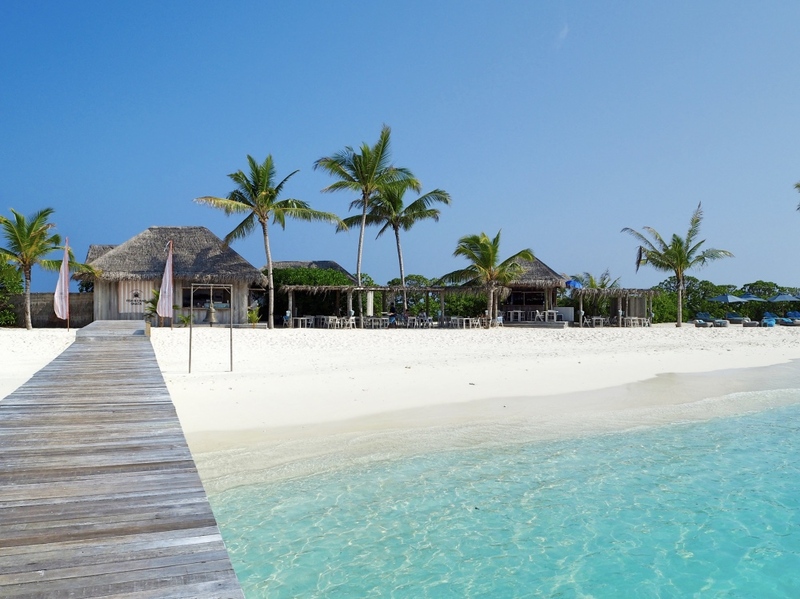 If you are considering a trip to the Maldives, I strongly recommend staying at Finolhu. It might be a bit expensive but the experience you will get makes it truly worth it. 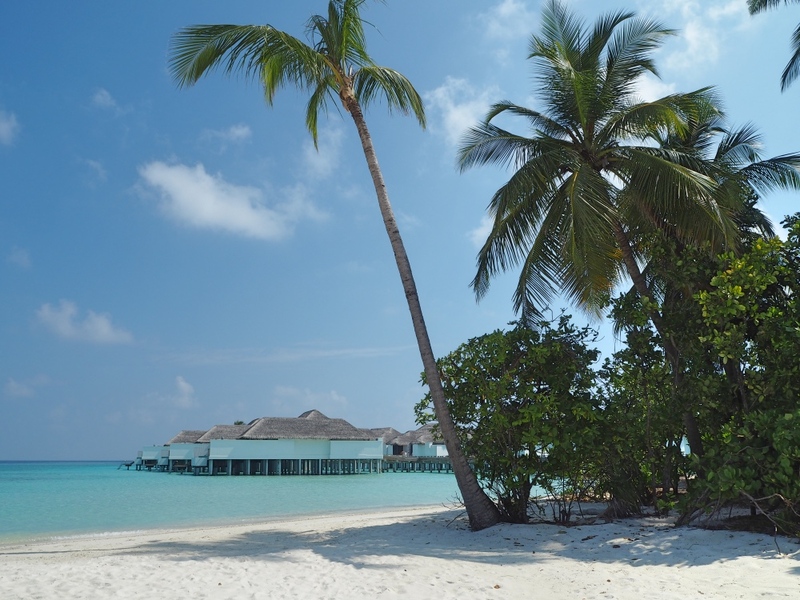 Our week in Finolhu was a week of pure indulgence and total relaxation. It was all we hoped for and more. This was definitely a crazy idea that turned into one of the best holidays ever! I can’t wait to head back there again some day. 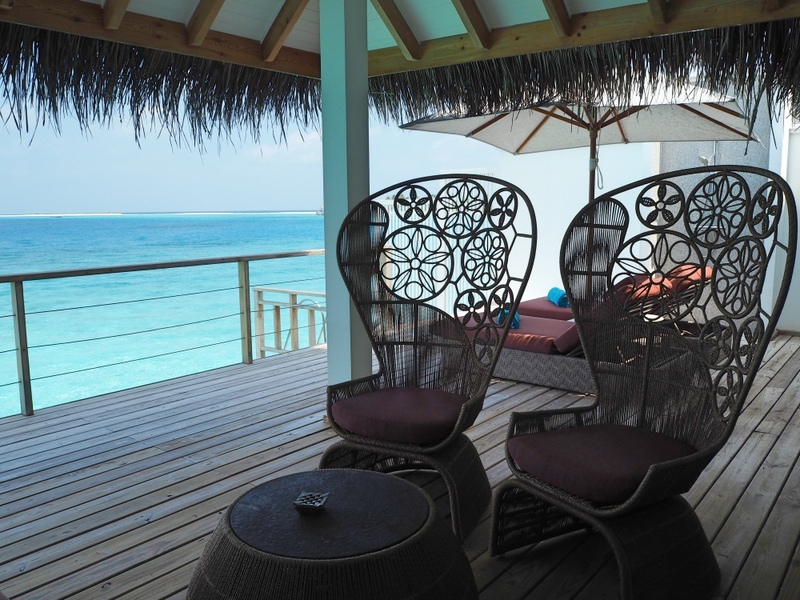 If you live in Australia, keep an eye out for Luxury Escapes deals to Finolhu. It certainly saved us a lot of money. Click here to check out the latest prices for Finohlu. Hi! I enjoyed your post! We will be there soon through Luxury Escapes as well and our deal includes a meal at each of their specialty restaurant. I was wondering what this means – whether we can order whatever we like from the menu or is it a set menu? If the latter, I hope it’s not too limiting. Look forward to your response! Hi Kat, you will love Finolhu. Such an beautiful place. All the restaurants were amazing. The Crab shack for lunch is fabulous, feet in the sand and all. In all the restaurants we were allowed to order whatever we liked from the main menu (a starter, main and dessert). It was not limited to a few items. At least that was the case in March 2017. Have fun!